I had to name this post that because it’s what I’ve been doing every year… see? I was there representing Autism Speaks, and in case you don’t remember, I am their Team Up Development Manager, that is my full time job! Will tell you more about it soon so you remember, but I love it. I am a very lucky girl! At the lunch, I met up with a few ex-coworkers, lots of friends, team mates, running heroes of mine, and people I know from having basically worked or volunteered at every sports/non-profit in nyc. It is like a May ritual, and you see everyone. George Hirsch spoke first, then Matt Long came up. I’ve seen Matt speak millions of times. Do a search on my blog, you’ll get bored but you might find some of his slides in there. He’s amazing. Every time. I was, as usual, crying. I think it’s because he represents all I am most afraid of. What if, one day, something happens and I can’t run? I am not sure I am as strong as he is. But he does a hell of a job of getting a room teary and moving me to question all I could do as an athlete and human being. Every time I see, hear, watch, read anything with Matt, I become emotional. It was the first article I read in RR and what got me hooked. 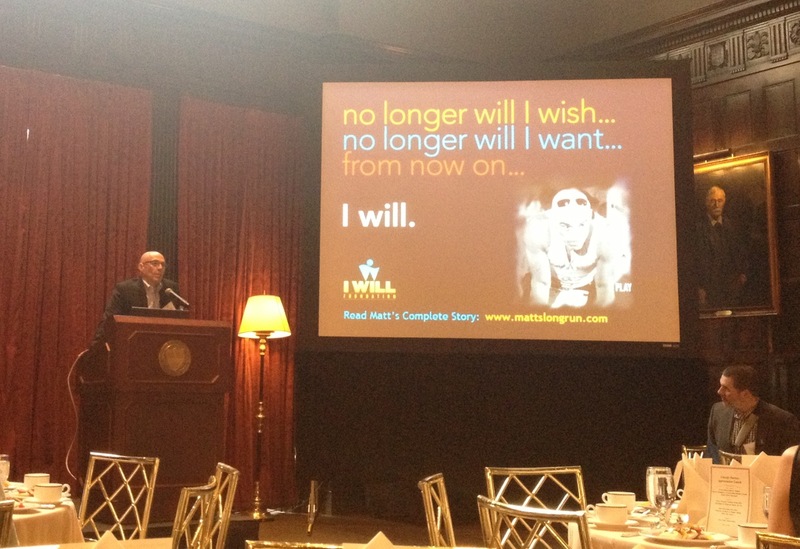 I Will is in my heart as an ex NY’r, as a runner and as my inspiration to due what I know I can do. i can’t help myself either!